The LVCVA Purchasing Department is responsible for posting bid opportunities. The LVCVA uses the Nevada Gov eMarketplace to list and award all general bid opportunities. Suppliers must register on the site and agree with all terms and conditions. If you are interested in Las Vegas Convention Center District (LVCCD) special bidding opportunities, complete the Supplier Registration here. The latest opportunities as well as the project overview is located on this site. Achieved by the LVCVA since the awards inception in 1995, this award is the pinnacle achievement in agency procurement. The LVCVA achieved the OA4 in 2015. 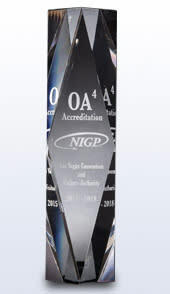 The OA4 recognizes agencies that lead the public procurement profession through the implementation of best practices.